Good news: Germans no longer have to hide their heads in shame, for now they have their very own scandalous, gorgeous political wife. Carla Bruni - and Michelle Obama - best watch out. On Friday, Christian Wulff, 51, was sworn into office as Germany's youngest postwar president. He brought with him his wife, Bettina Wulff (formerly Koerner) who, at 36, is a full 15 years younger and to hear the press tell it, a good deal hotter. She's also apparently hotter than his last wife, who he divorced in 2006 to marry Bettina. Though this sort of thing might normally cause a scandal, Christian managed to avoid too much criticism by going on the offensive and introducing Bettina to the press as his new love. They were married in 2008, but with Wulff's election last week, the couple was thrust into the international spotlight. The German First Lady is quickly becoming a media favorite. And though she would certainly face increased scrutiny no matter what she looked like, it doesn't help that she's beautiful. And young. And blonde and thin and (gasp) tattooed. She's also a second wife. All of these factors have made Bettina the subject of some breathless, tabloid-esque reporting - and garnered comparisons to France's charismatic ex-model/singer first lady Carla Bruni-Sarkozy. 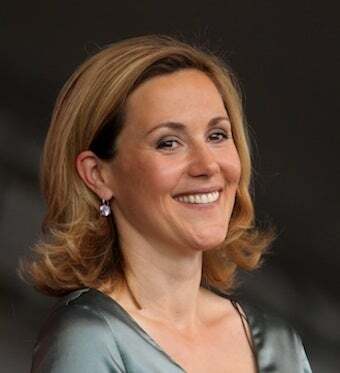 According to the Sydney Morning Herald, who translated it from German so that I didn't have to, the Die Zeit newspaper called "picking" Bettina "the best decision Wulff ever made. Germany will have a First Lady whose picture soldiers will love pinning up in their lockers." Others have quoted Christian on Bettina's affinity for rock concerts; "Hey, I've got a cool wife," he famously said. But the "cool wife" isn't so beloved by conservative newspapers. 'There are many who say Christian's ambitions for high office all stemmed from his wife,'' said Berlin's left-wing Tageszeitung daily. ''No wonder that he finds his wife cool.'' Another "friend" called her the "epitome of a climber." And did we mention she's hot? The Sydney Morning Herald calls her a "glamazon," and last week, a reporter for Reuters claimed that she "lends glamour to top job." "There were as many pictures of Bettina Wulff in a tight black dress — discreetly covering her shoulder tattoo — in German newspapers after his election Wednesday than there were of Christian, Germany's 10th post-war president," points out Erik Kirschbaum, who opens his article by mentioning her "towering height, striking looks, glamorous outfits - and a large tattoo on her right shoulder." The tattoo, which is apparently an intricate black design (Bettina explained it thusly: "I like the shape and I don't have any problem with it"), prompted Styleite to suggest our very own FLOTUS should get inked. Because nothing says "edgy political wife" like a little bit of body art. But perhaps we're being a little territorial. After all, Michelle Obama has kind of been hogging the First Lady spotlight, sharing it sporadically with Bruni-Sarkozy. More than one source has quoted Bunte, the celebrity magazine that asked: "Will Bettina Wulff become Germany's Michelle Obama?" All three women are attractive and stylish, which makes them somehow edgy, unexpected - the next wave of political wives. So, instead of getting all jealous (or righteously critical of the international obsession with thin, blonde, younger women) we would like to be the first to extend a big, hearty terrorist fistbump to our European cousins. Way to go, Germany. You got yourself a hot First Lady. Now let's get back to the real news, shall we?